These past weeks I've been working on a fun project for an upcoming post, which you'll see next week, and I needed a starting point for inspiration. This can sometimes be the hardest part for me and many times I've sat on work and pushed back deadlines for weeks, just trying to find a starting point or for an idea to simply find me. The challenge is to find something unique, or slightly unique which is challenging in this day when everything and everyone is so connected and we can views hundreds of ideas in seconds. It's easy to beat myself up over an idea that feels like something I've already done or something someone else has already done and this only leads to creative gridlock. Overthinking should have been my middle name because it is practically my approach to everything in life! This project I needed inspiration for (and I probably shouldn't even be saying this just yet) is for an outdoor picnic, or rather my take on an outdoor picnic and is the result of a partnership with a brand (who I will obviously mention next week) to create some of the elements myself. Without meaning to get too far off topic, I want to quickly mention that yes, I do work with brands and companies because as most bloggers do I also rely on sponsorship to keeps this blog's lights on and continue to spend adequate time investing into the blog. Please know that I do my very best to be selective with the brands/products that I partner with, always keeping in mind how important it is that they align with the rest of the blog to give you my most honest views. I've said "no" to many offers because I knew it just didn't work well with the blog or because I don't want you to feel that I don't want to undermine your intelligence! Honesty is so important in a relationship, increasingly so between a blogger and their viewers. Ok, I derailed from topic a little bit but I hope you don't mind?! I knew I wanted to use organic shapes for this project so I started a secret Pinterest board and collected photos of sand, of water that naturally lead to photos of plants and flowers. If you've been reading my blog for any length of time you know my tastes are a bit more demure, on the softer side and tone-on-tone with not too many very saturated colors, so with this in mind I wanted to find the simplest way to use this plant inspiration on print. 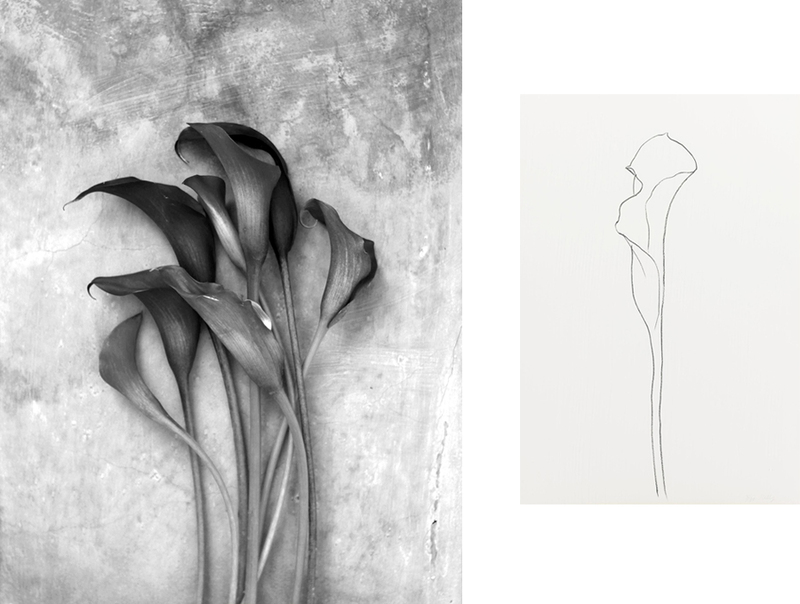 This lead me to the plant drawings of Ellsworth Kelly (see image to the right), of which I am now a die hard fan. I like the ease of the lines and the natural gradient of pencil trails left in each of his strokes. From here I knew I wanted to draw my own plant/flower shape so I picked up the most exotic flowers I could find at the store, which happened to be Calla Lilies and started photographing. The image on the left (color version here) was taken by me, in my living room and I used a plaster plant pot as the background. I must have taken over a dozen photos then carefully sifted through to find the ones I liked. From here I began sketching only to soon realize that maybe that the lily didn't have quite the shape I was after for the round materials they'd be printed on. In no time I was voraciously pinning images of poppies and dogwood. From here I made some simple sketches and if you follow me on Instagram you may remember this. Anyways, more of the finished work will be ready next week so you know, stay tuned!